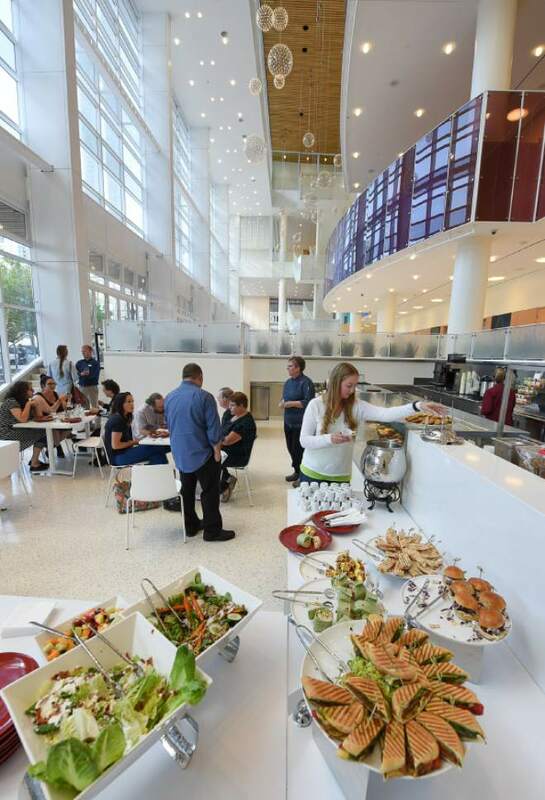 Eccles Theater • Food will play a starring role at Salt Lake City's new arts venue. Francisco Kjolseth | The Salt Lake Tribune Cuisine Unlimited Catering & Special Events has been selected to provide exclusive food and beverage services for the new George S. and Dolores DorÈ Eccles Theater in downtown Salt Lake City, slated for an Oct. 21, 2016 grand opening. Operations will include innovative theater concessions, catering for all events, group meetings and social celebrations in multiple venue sites within the theater, and management of a restaurant, named Encore Bistro at Eccles Theater. 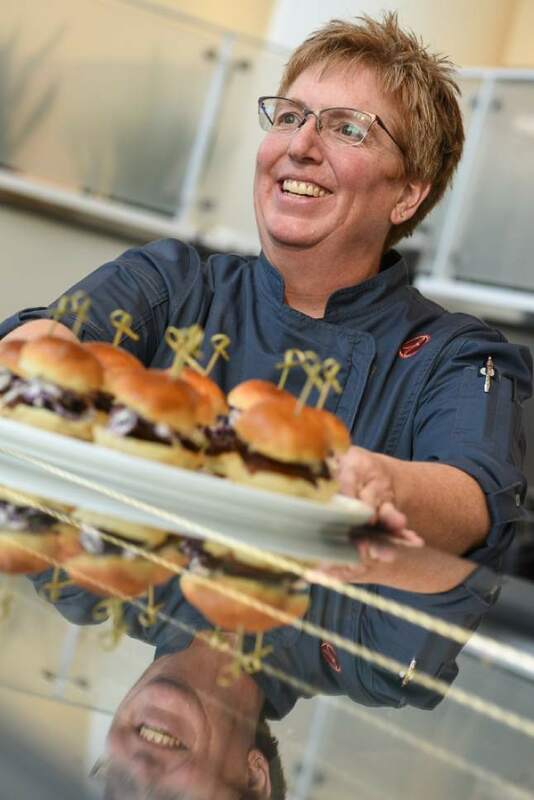 Francisco Kjolseth | The Salt Lake Tribune Executive chef Stacey Rosati serves up an order of sliders during a recent preview of Encore Bistro, located in the Grand Lobby of the new George S. and Dolores DorÈ Eccles Theater in downtown Salt Lake City. 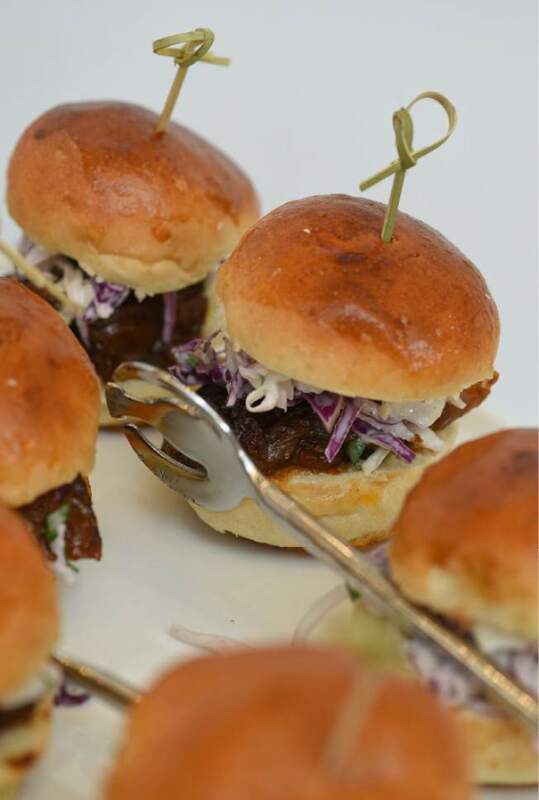 Francisco Kjolseth | The Salt Lake Tribune Encore Bistro's stage left sliders ($10.50, three per order): slow-braised beef, spicy BBQ sauce, toasted cumin and apple slaw. Francisco Kjolseth | The Salt Lake Tribune Encore Bistro's diva panini ($9.50): portobello mushroom, roasted red pepper, caramelized onions, grilled zicchini, spinach, havarti and pesto on a panini-grilled ciabatta bun. Francisco Kjolseth | The Salt Lake Tribune Cuisine Unlimited Catering & Special Events has been selected to provide exclusive food and beverage services for the new George S. and Dolores Doré Eccles Theater in downtown Salt Lake City, slated for an Oct. 21, 2016 grand opening. Operations will include innovative theater concessions, catering for all events, group meetings and social celebrations in multiple venue sites within the theater, and management of a restaurant, named Encore Bistro at Eccles Theater. 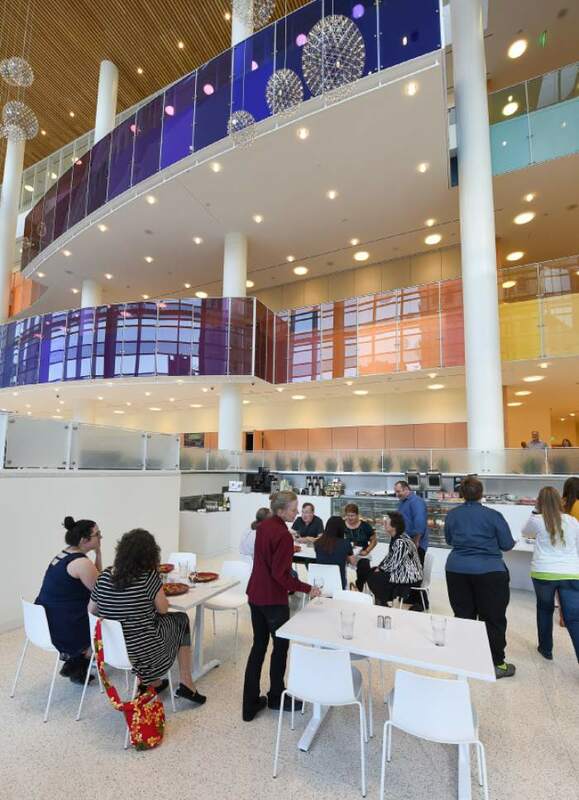 Crispy fried chicken, greasy french fries  or any messy deep-fried foods, for that matter  won&apos;t be on the menu at Salt Lake City&apos;s new Eccles Theater. Plenty of other meals and snacks, however  some healthy, others more decadent  will be available during Broadway shows, concerts and other entertainment events. Concessions at the new Main Street performing-arts venue, which opens Friday, will include a selection of snacks and beverages  including beer in what&apos;s described as a "grown-up sippy cup"  that patrons can take to one of the nearly 2,500 seats in the main Delta Performance Hall. "Anything that is sold out of the concession stands can go into the theater," explained Vicki Dunnington, the theater&apos;s executive director for food and beverage. "We worked really hard to select food that isn&apos;t messy and has packaging that is sustainable and quiet." That means no popcorn or traditional candy with noisy wrappers, she said. Instead, guests can choose other items like cookies from Salt Lake City&apos;s Ruby Snap Bakery, chocolates from C. Kay Cummings and caramels from JulieAnn&apos;s in Sandy. 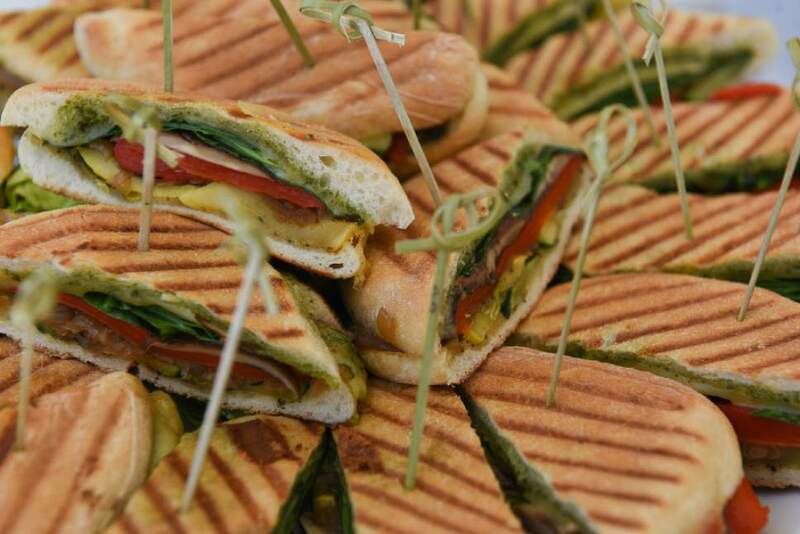 There also will be raw vegetables with hummus, small sandwiches and salads assembled by the in-house kitchen team. "With 2,500 people, we want to be able to give them many choices," said Dunnington, noting that concession stands are on all three theater levels so patrons shouldn&apos;t have to wait in long lines. Water and soft drinks will be sold in the original plastic containers  no glass is allowed in the building. Bottled beer will be poured into a plastic souvenir cup with a sturdy lid, the aforementioned "sippy cup." The theater has three separate liquor licenses from the Utah Department of Alcoholic Beverage Control. One allows beer that is 4 percent alcohol by volume (or 3.2 percent by weight) to be served from concession stands on performance nights; another allows alcohol at private catered events in various open spaces throughout the building; and a third allows beer, wine and spirits to be served  with food  at the Encore Bistro, the 40-seat restaurant in the theater&apos;s Grand Lobby. Behind the scenes • Cuisine Unlimited of Salt Lake City, which has catered events everywhere from the Salt Lake Winter Olympics to Red Butte Garden, is in charge of all concessions at the venue and will provide food for special events and group meetings. It also will manage the Encore Bistro. Stacey Rosati, a graduate of Johnson & Wales University with more than 20 years of culinary experience, is the theater&apos;s executive chef. She worked for Cuisine Unlimited and Deer Valley Resort early in her career, before owning a café in Driggs, Idaho. Rosati, a fan of live theater, returned to Utah and Cuisine Unlimited two years ago and jumped at the chance to work at the new theater  which has two large kitchens and two staging kitchens. "I&apos;m not just a food geek," she said recently. "I like and appreciate the arts, too." Before the show • The centerpiece of the Eccles Theater culinary program is the Encore Bistro, which opened in mid-September and serves breakfast and lunch weekdays from 7 a.m. to 3 p.m. It has a casual menu of soups, salads and sandwiches, with theater-inspired names such as the stage left barbecue sliders and the vegetarian diva panini. Prices range from $5 to $11.50. The Encore Bistro also will be open on performance nights, serving a more formal set-price dinner that is themed to match the current show. Prices for the three-course meal  including soup or salad, choice of entrée and dessert  will range from $22 to $25 per person. Wine, beer and cocktails will be available. For menu inspiration, Rosati said she has been reading scripts and listening to musical scores. She already selected the menu for "Beautiful: The Carole King Musical," first up on the Eccles Broadway series playbill Nov. 15-20. Described as East Coast comfort food, the meal includes a salmon and corn chowder and a kitchen clam bake, both inspired by the singer-songwriter&apos;s New York upbringing and warm lyrical songs. Rosati is still pondering the menu for the production of "Irving Berlin&apos;s White Christmas," which runs in December. Funeral potatoes definitely will be served when "The Book of Mormon" opens next year. For those who don&apos;t want a formal sit-down meal before the show, there will be an appetizer buffet on the third floor. Concession stands also will be open. Patrons can stop in the Encore Bistro during intermission, too, where snacks and drinks will be available. If purchasing wine, beer or cocktails, the DABC requires that you also order one of the "substantial food items" the restaurant plans to provide, said Rosati. Speaking of liquor service, a unique feature in the Bistro will be a "Zion Ceiling." Like its well-known sibling, the "Zion Curtain," the ceiling will prevent patrons standing on the colorful balconies in the theater&apos;s sweeping six-story open lobby from seeing alcoholic drinks being mixed and poured below. It wasn&apos;t clear that a ceiling was needed until a few weeks ago when a DABC compliance officer was making a final inspection of the restaurant and realized the Bistro&apos;s enclosed mixing booth  meeting the "Zion Curtain" requirement  was visible from above. Architects with HKS in Salt Lake City say they have built a cover that is opaque, a requirement of the DABC; and washable, to meet health department regulations. The addition will be made of "white sea-salt-colored resin," said HKS project manager Emir Tursic, who promised that it will fit the theater&apos;s "overall design." Premiere Performance • Rita Moreno will emcee the event, with performers including Tony winner Brian Stokes Mitchell, Tony-nominated Megan Hilty (of TV&apos;s "Smash") and performers from Ballet West, Repertory Dance Theatre, Ririe-Woodbury Dance Company, Utah Opera Chorus and the University of Utah theater department. When • Friday, Oct. 21, 7:30 p.m.
Tickets • $50-$200, available at the box office, at artsaltlake.org or by calling 801-355-2787; ticket holders will be invited to a post-show celebration on Regent Street. Dress is black tie (encouraged, not required).